In medium bowl, toss chicken with garam masala, salt and pepper flakes until chicken is coated. In 12-inch skillet, melt butter over medium-high heat. Cook chicken in butter about 4 minutes or until browned on first side; stir, and cook 2 minutes longer. Stir in onion; cook 3 to 4 minutes or until softened. Stir in broth, tomatoes and garlic; heat to boiling, stirring occasionally. Stir in rice; return to boiling. Stir; reduce heat to medium-low. Cover and cook about 20 minutes, without removing cover, until rice is tender and liquid is absorbed. Top with yogurt and cilantro. No basmati? Jasmine rice or plain long-grain white rice works well in its place. Garam masala is an Indian spice blend including hot and warming spices such as pepper, cinnamon, cardamom and cumin. What’s better than going out for your favorite Indian chicken dinner? Preparing your favorite Indian chicken recipe in the comfort of your own home and not having to tip! Of course, we made it easy, too. First, believe it or not, garam masala, salt and a touch of red pepper are really all the spices that are required. Plus while traditional butter chicken simmers for eons and oh yeah—requires a clay oven—this quick, easy-to-make recipe has the same authentic, simmered-for-hours flavor all in less than an hour and right on your stovetop. Needless to say, this is the authentic(ish) Indian chicken we’ll be making from now on. 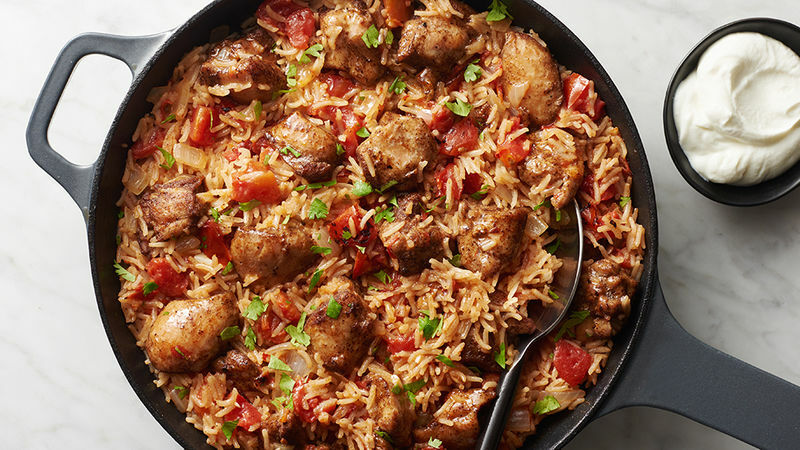 Find more irresistible skillet recipes here.